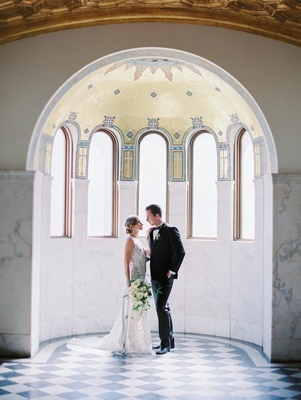 Home > Weddings > Romantic Inspirational Shoot at a Historic Venue in Downtown L.A. 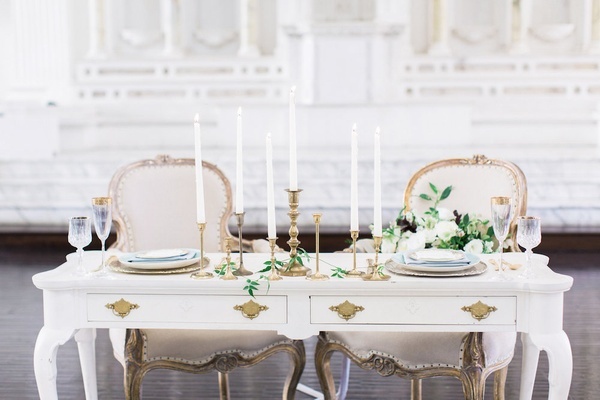 Romantic Inspirational Shoot at a Historic Venue in Downtown L.A.
Vivian Anne Delpilar and Pamela Joy Augustus of Love Anne Joy Design & Events worked closely with photographer Steve Torres to produce a classic, timeless aesthetic for the styled shoot they had in mind. 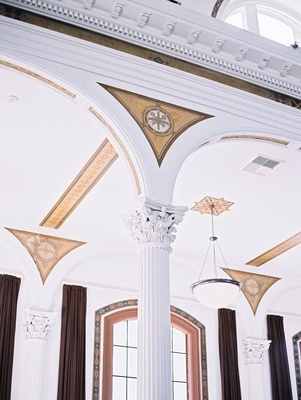 “When Vibiana was secured as the venue, we knew we wanted to ensure that [its] ornate architecture and sophistication translated through every vendor, piece, detail, and shot,” explain the pair. Natural light from tall windows bathed the space that boasted fluted Corinthian columns, frescoes, marble features, and dark hardwood floors. 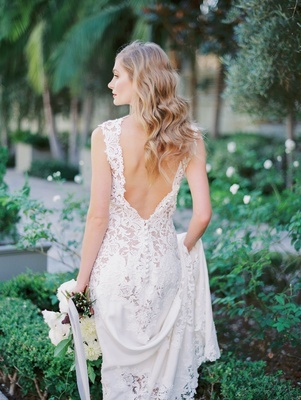 The bride entered the main hall reception in a two-piece gown crafted with off-white silk shantung lining and a French Chantilly lace pullover from the new JINZA Couture Bridal 2016 collection; a beaded and crystal sash accented her waist. Her relaxed coiffure revealed dazzling dangle earrings and was completed with a handmade gilded hair comb showcasing a floral motif. 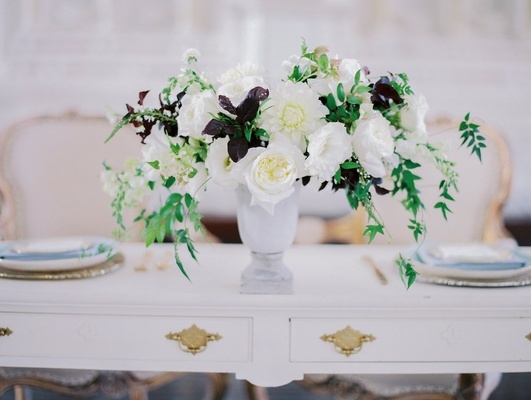 Plum leaves and greenery punctuated her garden bouquet of white blooms. 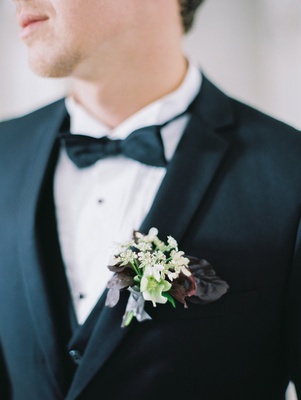 The groom was dapperly attired in a three-piece tuxedo. His unique boutonniere resembled a petite version of the nosegay held by his beloved. 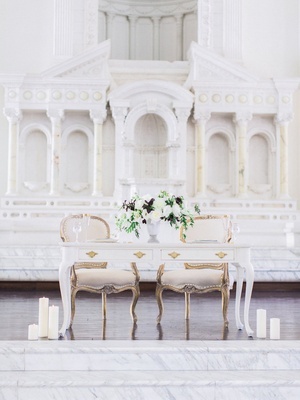 Vintage furnishings composed the sweetheart table against a magnificently carved Parian and Carrara marble backdrop. 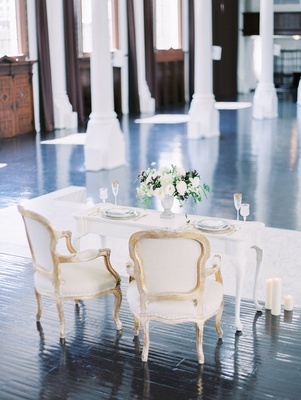 The couple took a seat on chairs with aged gilded frames. 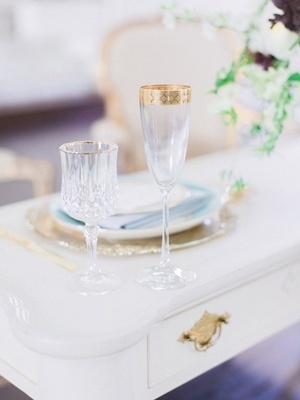 Two decorative options were presented on the white console table with brass accents. 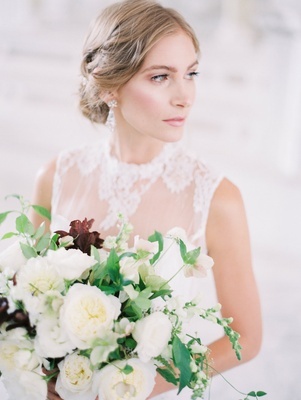 The first was an arrangement that echoed the bride’s pastoral bouquet in an urn. The second was a grouping of taper candles in varied gilt candlesticks accented by a leafy strand. 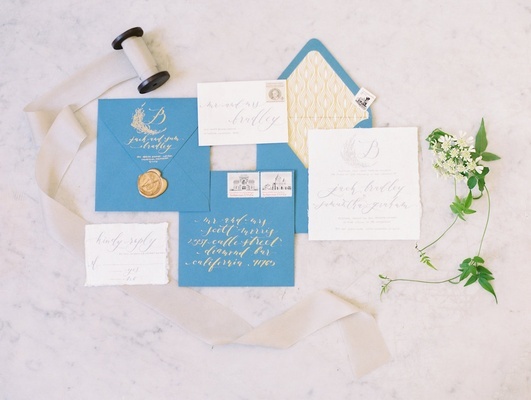 Place settings were inspired by the colors of the cerulean envelopes showcasing gold patterned linings in the invitation suite. 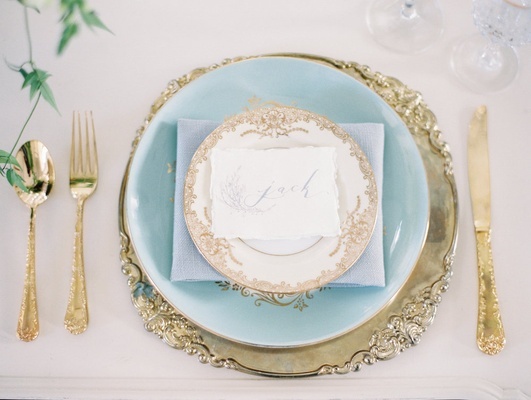 Matching the tone of flatware, golden chargers with ornate rims provided an exquisite frame for pale blue dinner plates, napkins, and dessert plates with a florid gilded design. 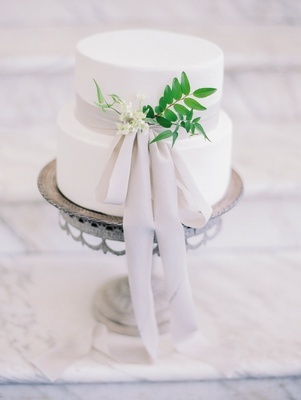 In keeping with the style of the invitations, names were elegantly written in grey ink and accented by a tree branch graphic on ivory place cards. 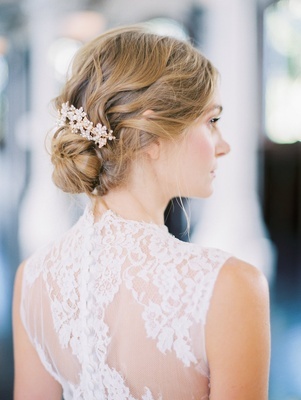 Deciding on an all-white palette foundation allows you to be creative in incorporating a myriad of accent colors – from soft pastels to vibrant hues – on your big day. 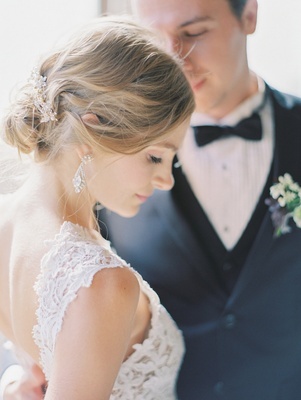 Take a look at the large library of real events on our weddings page for more inspiration.